When the shooting scenario calls for exact round placement - even hundreds of yards downrange - Bushnell Forge riflescopes are the answer. Bushnell's Forge line of optics are packed with features serious shooters demand. Forge riflescopes are weatherproof and waterproof, and equipped with the necessary tools to adjust to every shooting condition. The Forge 4. When the shooting scenario calls for exact round placement - even hundreds of yards downrange - Bushnell Forge riflescopes are the answer. Bushnell&apos;s Forge line of optics are packed with features serious shooters demand. Forge riflescopes are weatherproof and waterproof, and equipped with the necessary tools to adjust to every shooting condition. 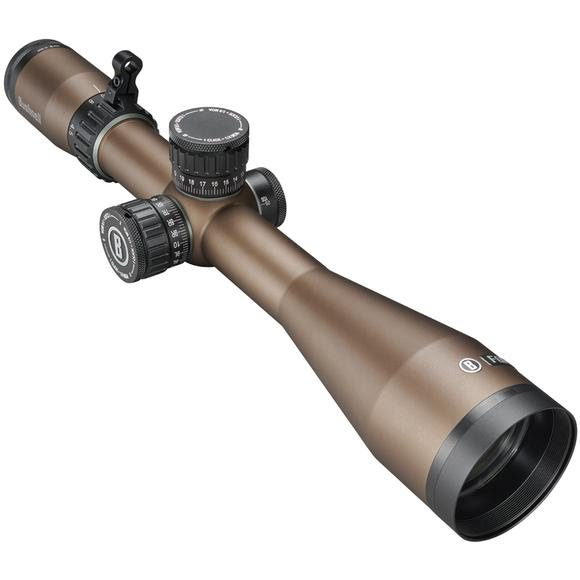 The Forge 4.5-27x50 riflescope features fully multi-coated lenses, EXO Barrier, and exposed locking turrets. The user friendly RevLimiter zero stop and IPX7 waterproof rating gives every hunter comfort in the field. This configuration features the Deploy™ MOA SFP reticle and a black finish. Included Butler Creek® Flip-Up Scope Covers protect lenses from dust, debris. Included 2.5-inch sunshade aids in target acquisition on bright days. Bushnell&apos;s newest and best protective lens coating molecularly bonds to the glass, repelling water, oil, dust, debris and preventing scratches. O-ring sealed optics stay dry inside, when immersed in three feet of water for up to 30 minutes. Anti-reflection coating applied to both lenses and prisms, for the best possible light transmission.